Every now and again we have to revisit the reasons sinking endless hours and buckets of coinstar trappings into our rides somehow worth the effort. Last week we motored down to Torrance from Montrose in the mighty Starion for some wrenching, a late cobb salad down at the Hof's Hut, and to pick up a turbo heat shield bracket that had snapped after twenty years of heat cycling. Kelly was prepping Mario's car for the trip to sin city, and Mark came over to suggest propane turbo engine swaps for the Starlet. 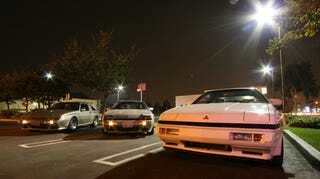 After some more wrenching on our own Starion we're off to SEMA today. If you see a mushroom cloud on your way out to Las Vegas don't worry. The nuclear test ban treaty is still in effect. The Star of Astron has merely gone supernova, and I'll need a ride.